Classic hunting rifles never go out of style. We thought our readers would enjoy some photos of a special Jack O’Connor Tribute rifle in .270 Winchester. This unique Model 70 is a featured SHOT Show 2013 rifle. It is being auctioned on Gunbroker.com, with proceeds to benefit hunting and shooting sports. Bids are currently approaching $7,000.00 with bidding open through January 18, 2013. Winchester Repeating Arms states that this 2013 SHOT Show Winchester Model 70 will be the last-ever Jack O’Connor Tribute rifle. The stock for this rifle is AAA grade Claro Walnut with Ebony forearm tip and shadowline cheekpiece. The rifle’s metalwork has been hand-engraved by the artisans at Baron Engraving. The rifle features a featherweight contour, free-floating barrel with target crown. Interestingly, the Leupold 4X Mountaineer riflescope mounted on this rifle is an original 1950s-era Mountaineer from the vaults of Leupold & Stevens. Sporting Classics offers a collection of great Jack O’Connor stories from the pages of Outdoor Life, Field & Stream, Petersen’s Hunting and other popular magazines of his day. 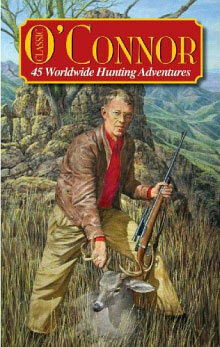 This 440-page book, entitled Classic O’Connor: 45 Worldwide Hunting Stories, is a sequel of sorts to Sporting Classics’ popular compendium, The Lost Classics of Jack O’Connor. In this collection, Jack O’Connor recounts his worldwide hunting adventures, during which he pursued everything from ducks to grizzlies, pheasants to kudu. Classic O’Connor presents several of the author’s greatest gun stories and a large selection of never-before-published photographs of the celebrated sportsman and his family on hunting adventures around the world. The book is illustrated with 40+ drawings by acclaimed artist Ron Van Gilder. Hardcover with dust jacket, the book lists for $35, but it can be purchased on Amazon.com for just $23.07. Share the post "Jack O’Connor Model 70 Tribute Rifle — A .270 Win of Course"